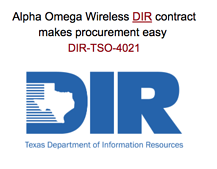 August 21, 2010, Sacramento, CA - Alpha Omega Wireless, Inc.
Alpha Omega Wireless, Inc. announces it will be expanding its product and solutions offerings by partnering with Firetide, Inc. a world leader in wireless mesh product solutions. AO Wireless will become a Premier Partner with a high level of commitment to the partnership. Firetide Premier Business Partners have in-depth outdoor wireless backhaul knowledge, market expertise, and the ability to provide full customer support. President Joe Wargo says, "We are excited to expand our offerings in the wireless mesh network solutions by partnering with Firetide. We have a long history of providing effective and reliable wireless backhaul networks for video backhaul. Firetide is an industry leader in manufacturing wireless Ethernet bridge and wireless mesh radio systems that excel in wireless backhaul of video. Over the years they have perfected their wireless mesh protocol for the efficiency of data and video over wireless backhaul.